Deslize pelas ruas sinuosas de Sevilha em uma bicicleta elétrica em uma excursão de 2,5 horas liderada por um guia experiente. Gaste energia mínima nas bicicletas seguras e de última geração, cujos motores elétricos permitem que você explore sem esforço a espetacular cidade espanhola. Admire a cor vibrante de bairros como Triana; passeie pela sublime praça da Plaza de España; e contemple a elaborada fachada da Catedral de Sevilha durante a sua exploração enriquecedora da cidade. A atenção personalizada do seu guia é garantida nesta excursão em grupo, com números limitados a oito. Cumprimente seu guia realizado em um local no centro de Sevilha e suba a bordo de sua bicicleta elétrica fácil de pilotar. Ouça um briefing de segurança abrangente e descubra os principais pontos turísticos de Sevilha. Siga seu guia pelas ruas sinuosas do centro da cidade, parando para observar estruturas como a Catedral de Sevilha e sua colossal Torre do Giralda. Ouça contos envolventes que combinam cultura, história e lenda ao capturar fotos além de pontos turísticos como a Plaza de España e a Torre Dourada. Faça uma pausa ao lado do complexo do Royal Alcazar, listado como Patrimônio da Humanidade pela UNESCO, e tenha uma visão fascinante de sua influência mourisca e da sucessão de imperadores excêntricos; explore o charmoso bairro de Triana para ver sua vibrante decoração e ponte icônica; e maravilhe-se com a majestade majestosa do Palácio de San Telmo ao passar pela intrincada fachada de tijolos vermelhos. Navegue pela estrutura culturalmente significativa da Praça de Touros do Royal Maestranza e, em seguida, viaje de volta ao ponto de partida original da excursão para se despedir de seu guia e grupo. It was the most memorable part of our Seville trip. Our guide Marie was clearly passionate about her work and had a good sense of humor. She made history so interesting with her anecdotes that 3 hours just flew by.I recommend taking this tour on your first morning in Seville as it gives you a great background for individual sight-seeing later on. You understand the city better. Do not worry about getting tired while riding as the bike does the work for you. Overall, an excellent experience! Luca begeleidde ons goed en vertelde ondertussen heel enthousiast over zijn stad, de bezienswaardigheden en geschiedenis. Hij gaf allerlei informatie over de plekken waar we langs fietsten en stopten en probeerde ons een kijkje te geven in de psyche van een inwoner van Sevilla (en Andalusië), waarom zij zich verbonden voelen met Noord Afkrika, hoe belangrijk Sevilla vroeger was en hoe zij hierdoor gevormd zijn. Een aanrader.  Our giude, Marie was very considerate, witty, and knowledgeable. Bikes were also very good machines. Good way to get to know the city in a very efficient way. Some may have trouble in finding the place. 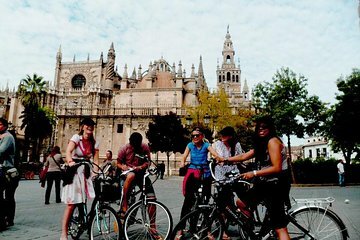 The bike tour was a terrific way to see the highlights of Seville on our first day. Marie really knew the history of Seville and presented the information in a story telling manner which made it most enjoyable. She also provided some great tips on things to do while we were there. Highly recommend biking over walking. My husband and I are 66 and 69 and had no problem with the bikes. My husband and I did this trip in late September 2017 and we booked the last afternoon tour. The electric bikes are really fun to ride it was the first time for both of us and we were able to see so much more of the city this way than we ever would have been able to see walking. Our guide also gave us great ideas during the tour of things we should try to do over the next few days, areas of the town we likely never would have visited if she hadn't suggested it. They also have an evening tour and I think that might be fun to do as well as the city is so beautiful I imagine it would be gorgeous lit up at night as well for this tour. Highly recommend! Well worth the money! Yep can't fault it best to go in the morning on your first day to get the lay of the land and Sussex out where you want to revisit and stay longer. Good bilked good guide lots to see and plenty of fun. This was our first ride on an electric bike and it was a little strange to start with, but we soon became accustomed to them. The tour was a lot of fun and the tour guide was informative. It's a great way to see the sites of the city and learn a bit about its history. Would recommend it. Excellent tour, just 4 of us on the tour. Recommend doing the late afternoon tour as it is so hot earlier in the day. Marie was great and also gave us an insight into living in Saville. Electric bikes not really necessary as Seville is really flat but still nice to be able to rest the legs in the heat with the electric power turned on. Wonderful way to see the gorgeous city of Seville! Cover a lot of ground without getting worn out and learn about the history while you do! Two of my girlfriends and I went on this tour in February and absolutely loved it. We ended up being the only three on the tour so we got the lovely guide all to ourselves. Marie was very knowledgeable and friendly and always made sure we were going at a pace that was comfortable to all. Highly recommend you start your visit with this bike tour to get a feel for the city.